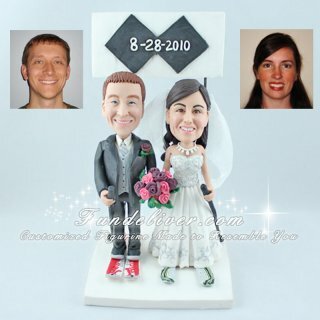 This is a completely skier theme cake topper ordered by one of our customers. 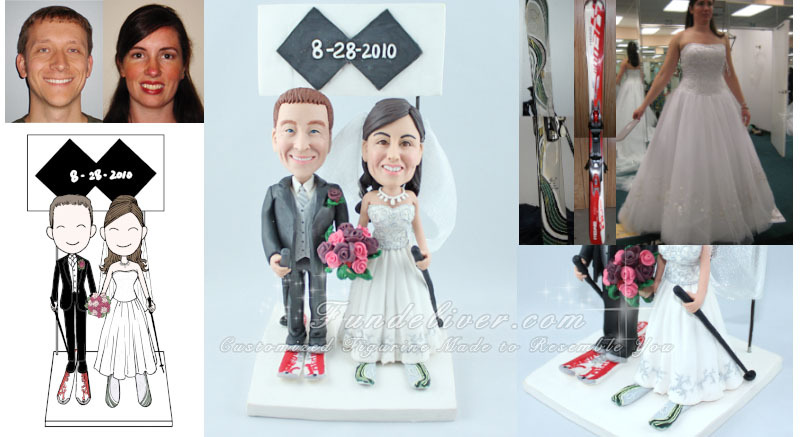 We have made many skier cake toppers and skiing wedding cake toppers. However this is really special with that trail rating symbol and level of difficulty, so we list it here. For background and base: the figurine stands in front of a white sign which has 2 large black diamonds. The wedding date of 8-28-2010 is written across the diamonds in white lettering. The base is white like snow. The double black diamonds are from the signage that you see on the ski slopes. Every run is named and 'graded' as easy, medium, hard, or expert and each grading is associated with a symbol: green circle for easy, blue square for medium, one black diamond for hard and double black dimond for expert. So the double black diamonds are intended to be a sign behind their figurine which also turn to be a highlight of this skier cake topper. They are mounted on a white rectangle and attached to the base with sticks/poles on either side. The groom wears an all black tuxedo with a single button jacket. The jacket is unbuttoned and there is a single maroon rose on the lapel. Also the groom has a vest beneath the jacket that a mostly white appearance but is actually patterned with small gray diamonds. For his skis, the brand is HEAD and they are red and white as above image. The bride wears a white, strapless, floor length dress which has silver threading, some white embroidery, and clear beading on the satin bodice. Also it has the train down in back. The necklace is made of small clay pearls with 7 larger pearls of alternating size/length hanging down in front. Bride’s hair has bangs swept across the forehead from left to right and half of her hair pulled back with the rest down with large curls. She also wears downhill skis. The brand is K2. They have a silver background with white and dark green swirls.